When plotting XY type data, Origin typically expects that the X and Y datasets be in columnar form. Multiple Y datasets with a shared X column would, of course, occupy multiple Y columns. Starting with Origin 2019, Origin is able to plot this row-wise data without first converting it to columnar data. We call it Row-wise Plotting and it is available from the Plot menu. Let’s show an example of creating a Row-wise Plot from row-wise data. If you wish to follow along or view the finished example (and other examples) for yourself, you can download the Origin Project. 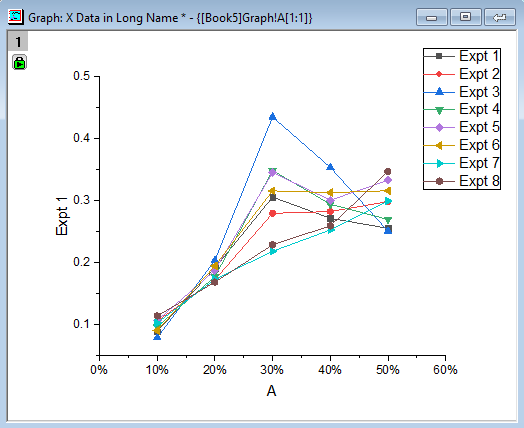 In the project, each graph associated with the relevant workbook is embedded into a worksheet entitled “Graph”. Double-click on the embedded graph to activate it. You can also click on the green lock icon and select Change Parameters… to see the settings used to create the graph. Example 1: Row-wise data with X dataset in Long Name label row. Select the rows of data. From the Plot menu, click on the Row-wise… icon. Unless Auto Preview is checked, click the Preview button to see a preview of the graph. Click OK to generate the graph. Note: You may observe a new worksheet has been added to the workbook. This sheet is automatically generated during the processing of creating the graph. Illustration of the steps in Example 1. Example 1: Generated Row-wise Plot graph. You will observe that the X axis tick labels have been converted to percent labels. This is possible because Origin recognizes that the X data in the Long Name row is numeric. In the Axis Dialog, the Tick Labels: Display is set to Custom and Custom Format set to #%. Example 2: Origin 2019 smartly parses numeric values from column label rows and plots them as numeric labels. First row in Row-wise Data: When selecting rows to plot, use the first selected row for the X dataset. First row in sheet: Use the very first row in the worksheet for the X dataset. Custom: Use the Hunt button to select an arbitrary row for the X dataset. Illustration of Y and Y Error dataset structure for Row-wise Plotting data. If you think you will be adding more rows of data at a later time, a good hint is to over-select the rows when creating the plot. For example, if you select an additional 5 empty rows after the data ends, you will be able to add up to five more rows later and they will use automatically incorporated into the plot graph. I am new to orgin pro. I am still giving it a try with trail version. I have difficulties plot reaction norms. I tried using the row wise plot and I can make reaction norms but they plot each replicates separate. Please see the attached example of my data sheet. I have two locations, and two genotypes and valules for RWC. I want site as X axis and average of RWC for each genotype and Y lable should display the two genotype names. Hope to get some advice from you. here are some simple steps to achieve what you want in Origin 2019. Note: It’s not supported in 2018 or lower versions. 2. Double click the box to open Plot Details dialog. 4. Enable Vertical Panel. Choose By Columns and click > to add Column Genotype. 6. You can click Ctrl+R to rescale the graph. 7. If you only want to see Mean, don’t want to see the 95% CI, double click the plot. Go to Box tab. Set Whisker -> Range as None.